Celebrate innovative engineering and design from one of the world’s most prestigious car manufacturers with this magnificent LEGO® Technic™ 42083 Bugatti Chiron model. Developed in partnership with Bugatti, the model captures the magic of the iconic supercar with its gleaming aerodynamic bodywork, logoed spoked rims with low‑profile tires, detailed brake discs and W16 engine with moving pistons. Open the doors and you'll discover an elaborate cockpit, featuring a Technic 8-speed gearbox with movable paddle gearshift and a steering wheel bearing the Bugatti emblem. Insert the top speed key to switch the active rear wing from handling to top speed position or lift the hood to reveal a unique serial number and a storage compartment containing a stylish Bugatti overnight bag. A classic Bugatti duo-tone blue color scheme reflects the brand's signature color, and a set of cool stickers for additional detailing adds the final touch to this exclusive model! Price is 31% below the initial Lego retail price, a € 125.00 discount! This comes down to 7.64 cent per brick. The Bugatti Chiron (42083) Lego set is available from the sites below. However, they do not offer delivery to your selected region. 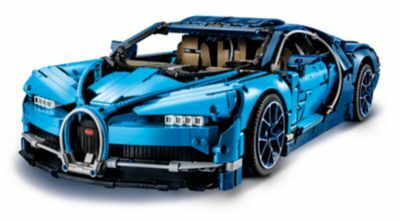 The Bugatti Chiron (42083) Lego set is no longer directly available from the sites below. However, 3rd party partners of these sites might still have the set available. Alternate description Discover the Bugatti Chiron! Exclusive 1:8 scale LEGO® Bugatti Chiron replica model with a wealth of luxurious features, including aerodynamic bodywork with an active rear wing, logoed spoked rims with low-profile tires, detailed brake discs and a W16 engine with moving pistons. Open the doors to access the detailed cockpit featuring a LEGO® Technic™ 8-speed gearbox with movable paddle gearshift and a steering wheel bearing the Bugatti emblem. Insert the top speed key to switch the active rear wing from handling to top speed position. Lift the hood to access a compact storage compartment containing a stylish Bugatti overnight bag. Check out the detailed W16 engine with moving pistons. Includes a unique serial number located beneath the hood. Comes with a classic Bugatti duo-tone blue color scheme that reflects the brand's signature color, plus a set of cool stickers for additional detailing. Delivered in luxurious box packaging. Includes a color collector's booklet with comprehensive building instructions. Bugatti Chiron measures over 5” (14cm) high, 22” (56cm) long and 9” (25cm) wide.